CHICAGO – Thousands rallied and marched peacefully in downtown Chicago Saturday in the biggest protests so far against NATO, the relic of the cold war holding a May 20-21 summit here. Daley Plaza in the Loop, which officially holds 5,000, was packed to capacity with crowds that spilled out into the surrounding streets and blocks. 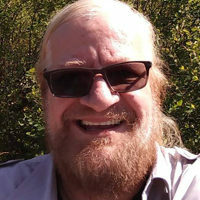 The rally was called by the nation’s largest organization of nurses, National Nurses United, which had declared May 18 , the eve of a G-8 gathering in Maryland and the NATO event here, a day of national action. 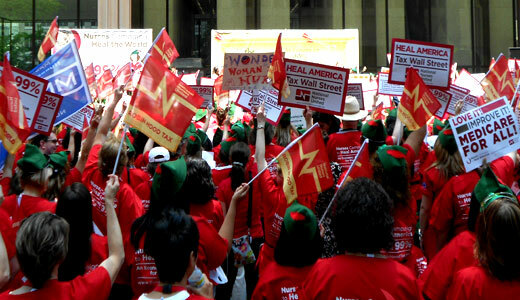 Thousands of nurses wearing their red union T-shirts and thousands of their supporters demanded passage of a “Robin Hood Tax,” a financial transaction tax on all Wall Street deals which the nurses say would heal the economic disaster engulfing the world. The highlight of the colorful and festive rally was a performance by the eminent musician and guitarist Tom Morello, of Rage Against the Machine fame. Chicago, which is Morello’s native city, threatened to move the rally away from the heart of downtown when word got out two weeks ago that he would perform. Morello, to the cheers of the thousands gathered at Daley Plaza, said that it was the power of a fighting union (the nurses) and public outcry that forced the city to allow the rally to go ahead at the originally planned location. Thousands of nurses in the crowd wore green Robin Hood caps to call attention to their demand for a tax on Wall Street stocks, bonds derivatives and other financial instruments that can raise up to $350 billion yearly to mitigate the economic crisis they say was caused by the banks. “The tax will generate the revenue needed for healthcare, to create jobs, and to build schools and strengthen all basic services,” said NNU Executive Director RoseAnn De Moro. Members of Occupy Chicago and of a variety of unions, anti-poverty groups and community organizations were present in the crowd and when large numbers of them walked to the rally location beforehand and away from it afterward they literally formed auxiliary protest feeder marches throughout downtown. When they passed the Congress Hotel on Michigan Ave. they joined and swelled the ranks of the handful of strikers who have been picketing the hotel for years in the longest ongoing strike in America. Police reported only one arrest all day. According to the National Lawyers Guild that one arrest was unjustified. Police never charged the person with any crime despite extensive questioning and eventually he was released. Community leaders around Chicago are beginning to express concern about how the unnecessarily heavy police presence downtown is draining police protection needed in the areas of the city where there is high crime.